Studies the accuracy, linearity and important characteristics of popular temperature measuring devices. 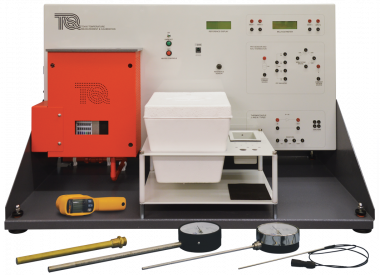 The Temperature Measurement and Calibration apparatus (TD400) fits on a desk or bench top. It includes eight different temperature measurement devices and shows their characteristics and how to calibrate them against a standard. The built-in precision reference sensor works as an accurate temperature reference. A display shows the temperature from the reference sensor and the local (barometric) pressure from the built-in pressure sensor. The display also calculates the local boiling point of water based on the barometric pressure. Students add crushed ice (not supplied) to the insulated icebox and clean water to the fully guarded water heater tank. A carefully rated immersion heater in the tank heats the water steadily up to boiling, giving time to take accurate results. The water heater tank includes a water level float switch and a safety temperature cut-out switch to turn off the heater in case of low water level. The water heater tank has a drain tap for connection to a suitable container or local water drain. This helps students to change the heated water safely and quickly, reducing experiment time. As an extra reference, a liquid crystal temperature indicator strip on the front of the heater tank shows its temperature during experiments. 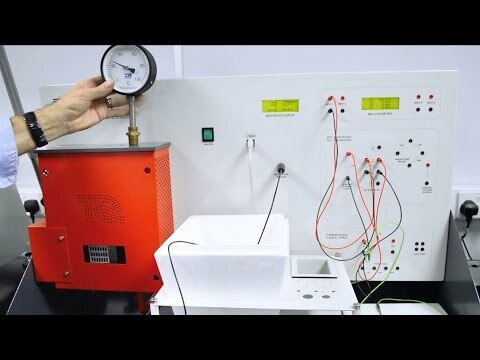 To the right of the temperature indicator strip, a window allows students to test the thermal infrared thermometer on a matt black or brushed steel surface of the heater tank. This shows limitations of infrared measurements caused by surfaces of different emissivity. The equipment includes a thermowell that works with the gas (vapour) thermometer to show temperature lag. Sockets on the front panel connect to electronic circuits and a multiline display that work with the electrical resistance and thermocouple devices. The sockets include resistances to simulate a resistance device and show the problems of adding resistances (for example - long wires) to your measuring circuits. An amplifier to increase the output of the thermocouples for more useful voltage measurement. Constant current and voltage sources, and a resistive bridge. 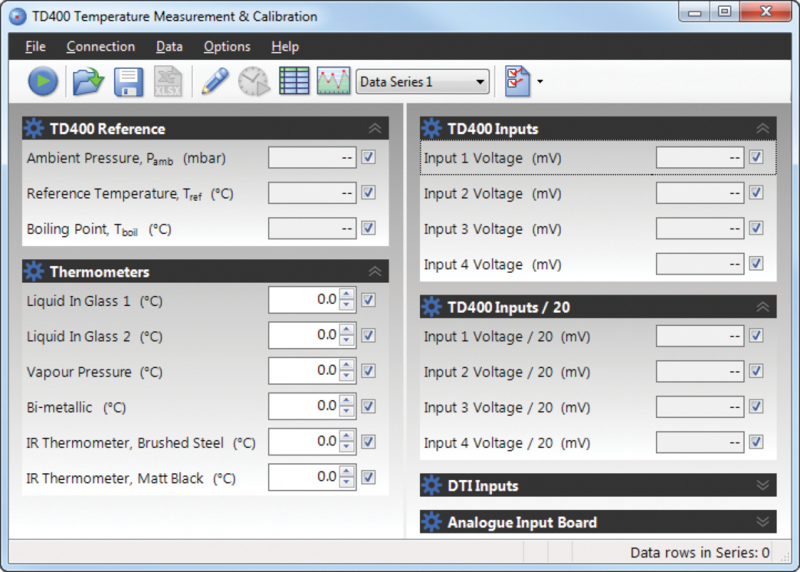 These show the problems with different measurement circuits and power sources for electrical temperature measurement devices. 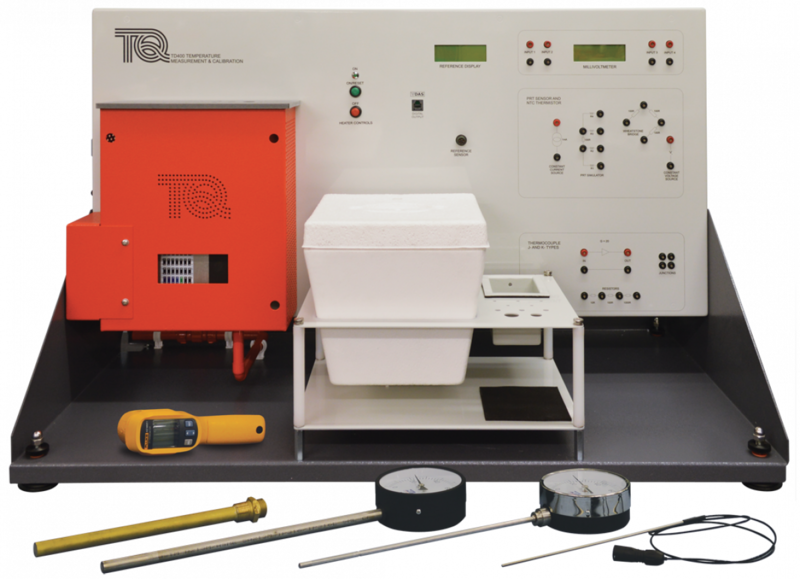 This equipment connects to TecQuipment's Versatile Data Acquisition System (VDAS®). Demonstration of heat transfer from one fluid to another through a solid wall. Introduction to the logarithmic mean temperature difference in heat exchangers. Comparison of different types of heat exchanger in terms of performance, size and relative cost (only if you have two or more optional heat exchangers). Flow-through and batch heating, with or without stirring, using a heating jacket or a coil. A bench mounting versatile data acquisition system (VDAS) to allow computer-based data capture for a wide range of TecQuipment products.